St. Joseph Parish - Weare: What is RCIA? Each year on Holy Saturday during the Easter Vigil, thousands are baptized into the Catholic Church in the United States. 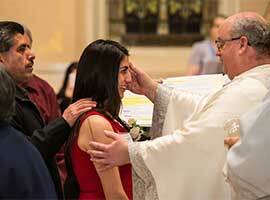 Parishes welcome these new Catholics through the Rite of Christian Initiation of Adults (RCIA). Listed below are some questions and answers about RCIA. What are the steps of RCIA? Prior to beginning the RCIA process, an individual comes to some knowledge of Jesus Christ, considers his or her relationship with Jesus Christ and is usually attracted in some way to the Catholic Church. This period is known as the Period of Evangelization and Precatechumenate. For some, this process involves a long period of searching; for others, a shorter time. Often, contact with people of faith and a personal faith experience lead people to inquire about the Catholic Church. After a conversation with a priest, or RCIA director, the person, known as an "inquirer," may seek acceptance into the Order of Catechumens, through the Rite of Acceptance. During this Rite, the inquirer stands amidst the parish community and states that he or she wants to become a baptized member of the Catholic Church. The parish assembly affirms this desire and the inquirer becomes a Catechumen. The Period of the Catechumenate can last for as long as several years or for a shorter time. It depends on how the person is growing in faith, what questions they encounter along the way, and how God leads them on this journey. During this time, the Catechumens consider what God is saying to them in the Scriptures, what changes in their life they need to make to respond to God's inspiration, and what Baptism in the Catholic Church means. When a Catechumen and the priest and the parish team working with him or her believes the person is ready to make a faith commitment to Jesus in the Catholic Church, the next step is the request for baptism and the celebration of the Rite of Election. 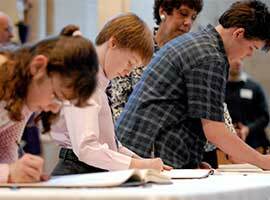 Even before the Catechumens are baptized, they have a special relationship to the Church. The Rite of Election includes the enrollment of names of all the Catechumens seeking baptism at the coming Easter Vigil. 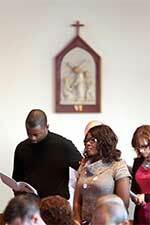 Typically, on the first Sunday of Lent, the Catechumens, their sponsors and families gather at the cathedral church. 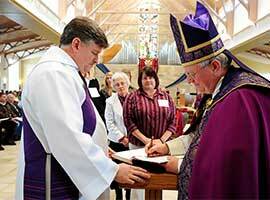 The Catechumens publicly express their desire for baptism to the diocesan bishop. Their names are recorded in a book and they are called the Elect. 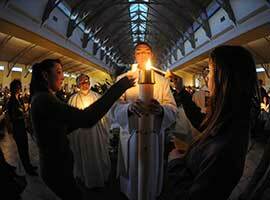 The days of Lent are the final Period of Purification and Enlightenment leading up to the Easter Vigil. Lent is a period of preparation marked by prayer, study, and spiritual direction for the Elect, and prayers for them by the parish communities. The Celebration of the Sacraments of Initiation takes place during the Easter Vigil Liturgy on Holy Saturday when the Elect receives the sacraments of Baptism, Confirmation and Holy Eucharist. Now the person is fully initiated into the Catholic Church. As a newly initiated Catholic, they continue their formation and education continue in the Period of the Post Baptismal Catechesis, which is also called Mystagogy. This period continues at least until Pentecost. During the period the newly baptized members reflect on their experiences at the Easter Vigil and continue to learn more about the Scriptures, the Sacraments, and the teachings of the Catholic Church. In addition they reflect on how they will serve Christ and help in the Church's mission and outreach activities. What is meant by coming into full communion with the Church? Coming into full communion with the Catholic Church describes the process for entrance into the Catholic Church for already baptized Christians. In most cases, these individuals make a profession of faith but are not baptized again. To prepare for this reception, the people, who are called Candidates, usually participate in a formation program to help them understand and experience the teachings and practices of the Catholic Church. Although some preparation may be with Catechumens preparing for baptism, the preparation for Candidates is different since they have already been baptized and committed to Jesus Christ, and many have also been active members of other Christian communities. The Candidates may be received into the Catholic Church at the Easter Vigil or at another Sunday during the year depending on pastoral circumstances and readiness of the Candidate. 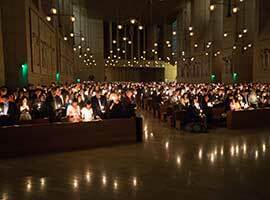 What is the Easter Vigil on Holy Saturday like? 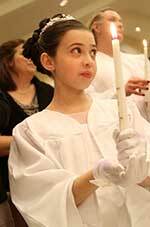 The Easter Vigil takes place on Holy Saturday, the evening before Easter Sunday. This is the night that "shall be as bright as day" as proclaimed by the Exsultet, an ancient church hymn as we joyfully anticipate Christ's Resurrection The Holy Saturday Liturgy begins with the Service of Light, which includes the blessing of the new fire and the Paschal candle which symbolizes Jesus, the Light of the World. The second part consists of the Liturgy of the Word with a series of Scripture readings. After the Liturgy of the Word, the Catechumens are presented to the parish community, who pray for them with the Litany of the Saints. Next, the priest blesses the water, placing the Easter or Paschal candle into the baptismal water. Those seeking Baptism then renounce sin and profess their faith after which they are baptized with the priest pronouncing the words, "I baptize you in the name of the Father, and of the Son, and of the Holy Spirit." After the Baptism the newly baptized are dressed in white garments and presented with a candle lighted from the Paschal Candle. They are then Confirmed by the priest or bishop who lays hands on their heads, and invokes the outpouring of the Holy Spirit. He then anoints them with the oil called Sacred Chrism. The Mass continues with the newly baptized participating in the general intercessions and in bringing gifts to the altar. At Communion, the newly baptized receive the Eucharist, Christ's Body and Blood, for the first time. What does the white robe symbolize? The newly baptized are dressed in a white garment after baptism to symbolize that they are washed clean of sin and that they are called to continue to walk in this newness of life. What does the candle symbolize? A small candle is lit from the Easter candle and given to the newly baptized as a reminder to them always to walk as children of the Light and to be the light of Christ to the world. What does the Sacred Chrism symbolize? 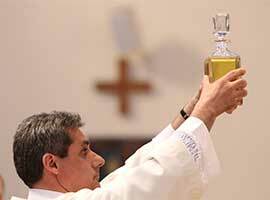 The Sacred Chrism, or oil, is a sign of the gift of the Holy Spirit being given to the newly baptized. It is also a sign of the close link between the mission of Jesus and the outpouring of the Holy Spirit, who comes to the recipient with the Father in Baptism. Why was this ancient rite restored? It was restored in the Church to highlight the fact that the newly baptized are received into a community of faith, which is challenged to realize that they too have become different because of this new life in the community. Is there a ceremony or preparation for Catholics who never or seldom have practiced the faith? For Catholics who have been Baptized, Confirmed and made First Communion but then drifted from the faith, the way they return is through the Sacrament of Penance. Catholics who were baptized but never received Confirmation and/or Eucharist also participate in a period of formation. This process of formation is completed with the reception of the Sacraments of Confirmation and Holy Communion often at the Easter Vigil or during the Easter Season. What is the role of a godparent for an adult being baptized? Prior to the Rite of Election, theCatechumen may choose one or two godparents, who will accompany the Catechumen on the day of Election, at the celebration of the Sacraments of Initiation, and during the Period of Mystagogy. They are called to show the Catechumens good example of the Christian life, sustain them in moments of hesitancy and anxiety, bear witness, and guide their progress in the baptismal life. The Rite of Christian Initiation for Adults, or RCIA, is a communal process for formal initiation of new members into the Catholic Church. This process is a return to the formation of the earliest members of the Church in the first and second centuries.